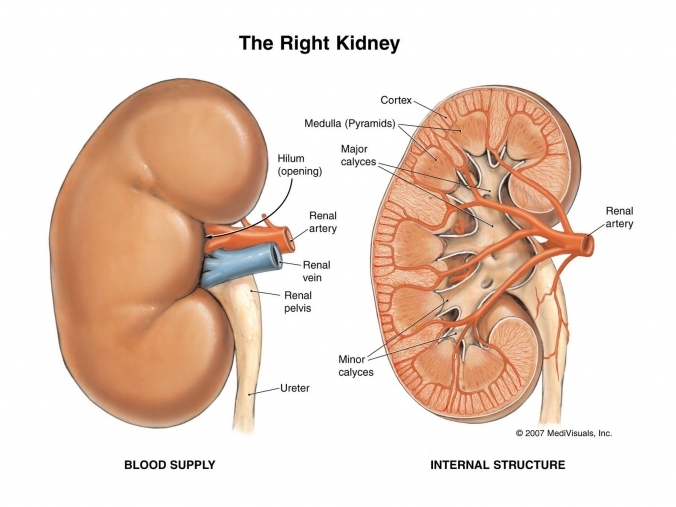 Kidney infection (pyelonephritis) is a specific type of urinary tract infection (UTI) that generally begins in your urethra or bladder and travels up into the kidneys. Pyelonephritis is a kidney infection usually caused by bacteria that have traveled to the kidney from an infection in the bladder. Kidney infection typically occurs when bacteria enter to the urinary tract through the tube that carries urine from the body (urethra) and begin to multiply. Bacteria from an infection elsewhere in the body also can spread through the bloodstream to the kidneys. Women have more bladder infections (also called urinary tract infections) than men do because the distance to the bladder from skin, where bacteria normally live, is quite short and direct. However, the infection usually remains in the bladder. Nursing Diagnosis for Pyelonephritis : Impaired Urinary Elimination (dysuria, urge, frequency, and or nocturia) related to a kidney infection. 1. Measure and record urine each time urination. R /: To determine the changes in color and to determine the input / out put. 2. Instruct to void every 2-3 hours. R /: To prevent the buildup of urine in the urinary vesicles. 3. Palpation of the bladder every 4 hours. R /: To determine the presence of bladder distension. 4. Help clients to the restroom, use bedpans / urinals. R /: To facilitate clients in urination. 5. Help clients get a comfortable position to urinate. R /: So that the client is not difficult to urinate. 6. Encourage increased fluid intake. R /: Increased hydration rinse bacteria. 7. Observations of changes in mental status:, behavior or level of consciousness. R /: Accumulated residual uremic and electrolyte imbalance can be toxic to the central nervous system.